Ready to apply to be a Selected member? Download the application packet. What is Selected Independent Funeral Homes? We are a worldwide trade association of independently owned funeral homes with a common interest in continuous growth to best serve families and individuals with compassionate care and professional integrity. Members agree to uphold the association's Code of Good Practice and to abide by the other requirements of membership. 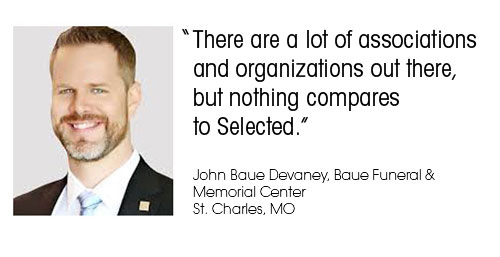 Because Selected members are the best in the profession, some of our most important offerings are those that allow members to connect and learn from each other; for example, our meetings and online discussion groups. We also offer valuable programs and services to help your business grow. And because membership in Selected is by firm, everyone on your staff can participate. Click here to learn about all the benefits of membership in Selected. Membership is by invitation only and is extended to worthy funeral homes through an approval process that involves research and member input. If you are interested in exploring the possibility of membership, click here to apply. There is a level of trust and sharing within the membership of Selected that only the experience of membership can fully reveal. This is your opportunity to act toward becoming a part of this outstanding group. We will strive to help you accomplish this goal. Let our members tell you why. "Things have changed over the years, and with that, the Selected is changing. The association really listens to what the members want."